My hands down favorite salad is the the classic Italian Panzanella Bread Salad. Fresh tomatoes, cucumbers and olives mingle with balsamic vinegar, then hearty bread croutons sop up the dressing and release all the flavor in one bite. I can eat my weight in this salad. Since I decided to lay off gluten for a few weeks, this classic version is off my list. That opened the door for a new, modified recipe! The crunchy seasoned croutons are really my favorite part about this salad so it is important to find an equally yummy crunchy replacement. Crispy chickpeas did the trick. While keeping most of the salad intact, chickpeas done two ways rounded out both the flavor and texture. 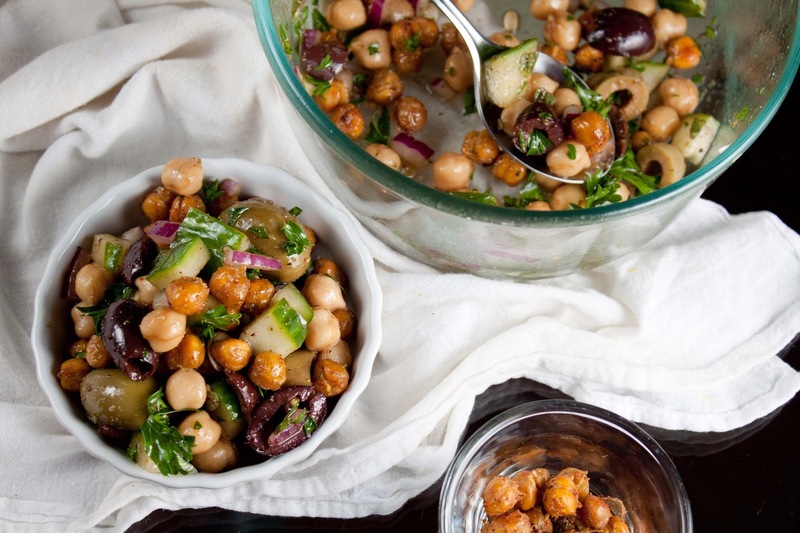 The salad comes together in snap, but remember you need time to bake the legumes. Perfect for a light lunch or next to a grilled turkey, chicken or pork, this Fat and Happy Chickpea Panzanella Salad is a winner, gluten free or not! 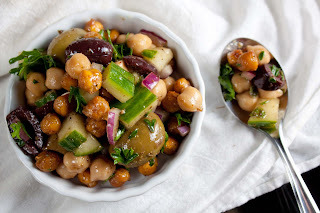 Fat and Happy Food Blog Tips and Techniques: When baking the crispy chickpeas, I find them a bit better if cooked slower at a lower temperature, but you can cook them at a higher temperature quicker if you are in a hurry. 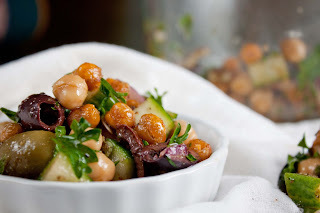 Make the salad while the crispy chickpeas are baking, this will give the flavors a chance to meld together. Toss all the ingredients together, except for the baked chickpeas, lest rest. Toss in the cooled baked chickpeas and serve. Pour the chickpeas onto a clean kitchen towel, lightly dry off. Place on a cookie sheet. Drizzle a little olive oil across the sheet, roll the chickpeas around. Sprinkle each of the seasoning on, roll the chickpeas again to to ensure even coverage. Place in a 250 degree oven until desired texture is reached (expect a few hours.) Remove from oven and cool.